Another day, another water break! 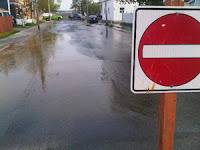 Residents around the intersection of Mayor Avenue and Merry Meeting Road, and with Howley Avenue awoke to another water main break which flooded the streets and some basements. Apparently it is the fourth time in recent months that the main has broken. Residents say the City placed the blame on frost and cold weather in the past. That excuse is not going to hold much water today! Water lines in the older parts of St. John's are reaching the end of their lifespan and is decaying rapidly. The issue of under-maintained infrastructure is pivotal to the finances of the city which has undergone phenomenal growth over the past decade. St. John's City Council has pleaded with the provincial government to implement a new funding arrangement. In particular, the regime has been asked to revisit a policy that prohibits the city from collecting tax from the provincial government for its properties, including hospitals, even though it must provide municipal services. This issue has been a bone of contention for the crew at Gower Street for a generation, going back to the days of the Wells, Tobin, Grimes, Williams and now the Dunderdale administration. Peter. I don't trust the crowd on new Gower with more money. Doc and the councils quest for world class city should start with world class water and sewer and roads. But debate each week is dominated by cruise ships, sheilaghs weed killer issue, skateboard parks and stuff that are prov or fed issues that I think are distractions from the fact they are poor Stewart's of taxpayers money. They need to focus on basic services. Everything else is gravy. ..they need to start cutting some staff and get salaries inline and get rid of some holidays so that it is more reflective of everyone else. ..just some thoughts. ."